The UNM MTTC Cleanroom opened with Phase I operations during Fall 2001. 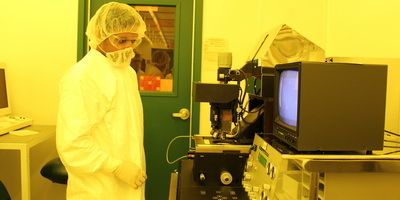 Since then, the cleanroom has supported several UNM courses, including ECE-474/574 Microelectronics Processing, ECE-495 MEMS, ChNE-586 Statistical Design of Experiments for Semiconductor Manufacturing, and NSMS-519 NEMS/MEMS. In addition, the Cleanroom has supported several courses at regional community colleges, including Semiconductor Manufacturing Technologies (SMT) and Microelectromechanial Systems (MEMS) courses offered by the Central New Mexico Community College. The MTTC Cleanroom is also a training venue for Manufacturing Technologies (MT) labs offered by the Southwest Indian Polytechnical Institute (SIPI). And, the cleanroom supports MEMS workshops for the NSF-sponsored Southwest Center for Microsystems Education (SCME, see link below). The cleanroom also supports basic university research, and prototype development by small companies. The photolithography bay is Class-100. The MTTC Cleanroom is a university Service Center, thus there is a fee for use (see Rate Structure, below). Phase II construction, completed 2007, added a bay/chase space, and NSF MRI-provided DRIE and Parylene coater tools. Phase III construction, completed for 2008, added another bay/chase space, and a six-stack atmospheric and LPCVD furnace. Phase IV construction, for 2009-12, added a RF-sputtering machine and an upgrade to the air-handling systems. The MTTC Cleanroom has chilled water, process chilled water (PCW), air handling units, DI/RO water, nitrogen, two scrubbers, acid waste neutralization and a backup generator, as equipment support infrastructure. The cleanroom also provides utility support to tenants in adjacent high-bays who seek to demonstrate prototype manufacturing.